Versions of PyGObject < 3.0.3 contain a bug which does not allow drag and drop to function correctly. Therefore a version of PyGObject >= 3.0.3 is required for the following examples to work. Setting up drag and drop between widgets consists of selecting a drag source (the widget which the user starts the drag from) with the Gtk.Widget.drag_source_set() method, selecting a drag destination (the widget which the user drops onto) with the Gtk.Widget.drag_dest_set() method and then handling the relevant signals on both widgets. 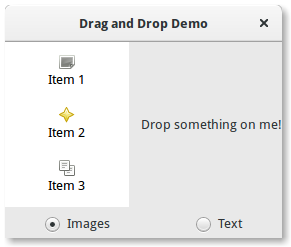 Instead of using Gtk.Widget.drag_source_set() and Gtk.Widget.drag_dest_set() some specialised widgets require the use of specific functions (such as Gtk.TreeView and Gtk.IconView). A basic drag and drop only requires the source to connect to the “drag-data-get” signal and the destination to connect to the “drag-data-received” signal. More complex things such as specific drop areas and custom drag icons will require you to connect to additional signals and interact with the Gdk.DragContext object it supplies. In order to transfer data between the source and destination, you must interact with the Gtk.SelectionData variable supplied in the “drag-data-get” and “drag-data-received” signals using the Gtk.SelectionData get and set methods. To allow the drag source and destination to know what data they are receiving and sending, a common list of Gtk.TargetEntry's are required. A Gtk.TargetEntry describes a piece of data that will be sent by the drag source and received by the drag destination. There are two ways of adding Gtk.TargetEntry's to a source and destination. If the drag and drop is simple and each target entry is of a different type, you can use the group of methods mentioned here. If you require more than one type of data or wish to do more complex things with the data, you will need to create the Gtk.TargetEntry's using the Gtk.TargetEntry.new() method.